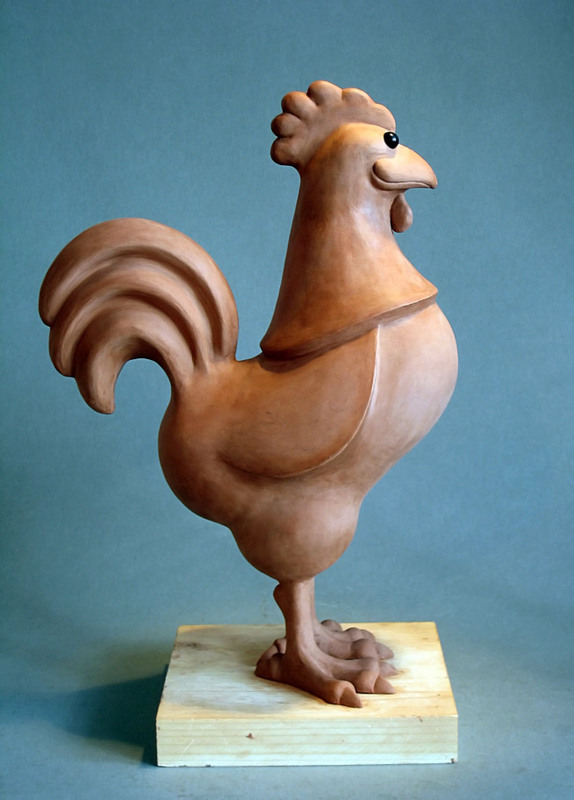 Below is a side-by-side comparison between the 33cm and 165cm sculptures (13 inches verses 5ft 5in). 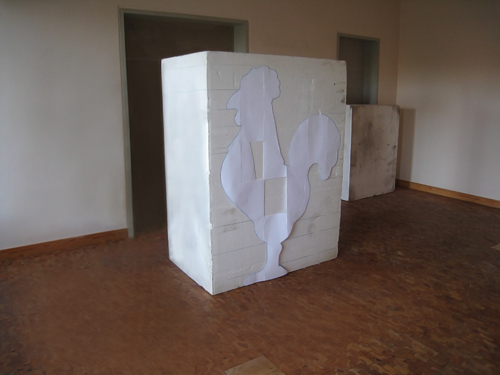 The full-scale model on the right is nearing completion and has already been partially coated to give it a smooth outer skin. 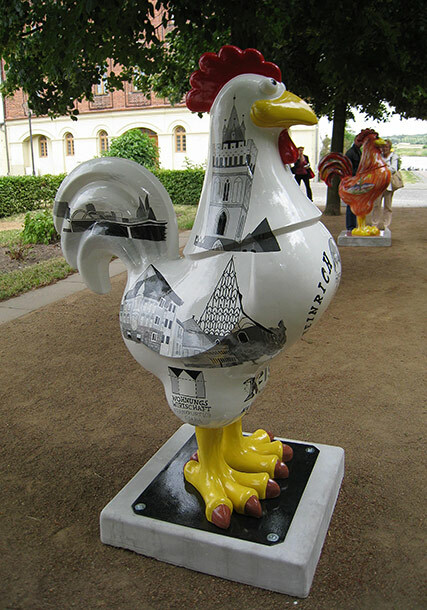 The large cockerel started off life as a rather large block of high-density polystyrene. 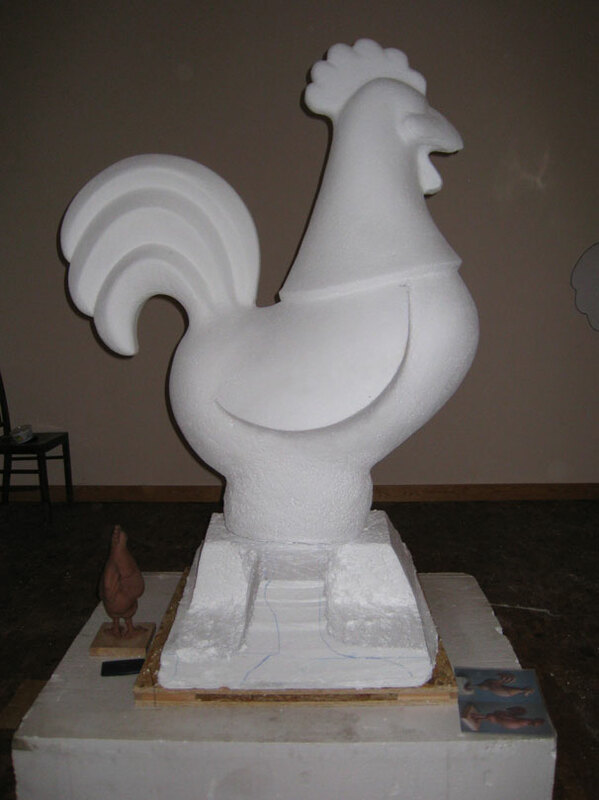 With sculptures of this size, it is often better to carve the main shape from polystyrene, this helps keep the weight down and is more practical than creating the entire sculpture from clay. Because the detail level on the cockerel was fairly low, it was possible to do the entire sculpt in polystyrene, and then coat the model to give it a hard surface, ready for the mold making process. 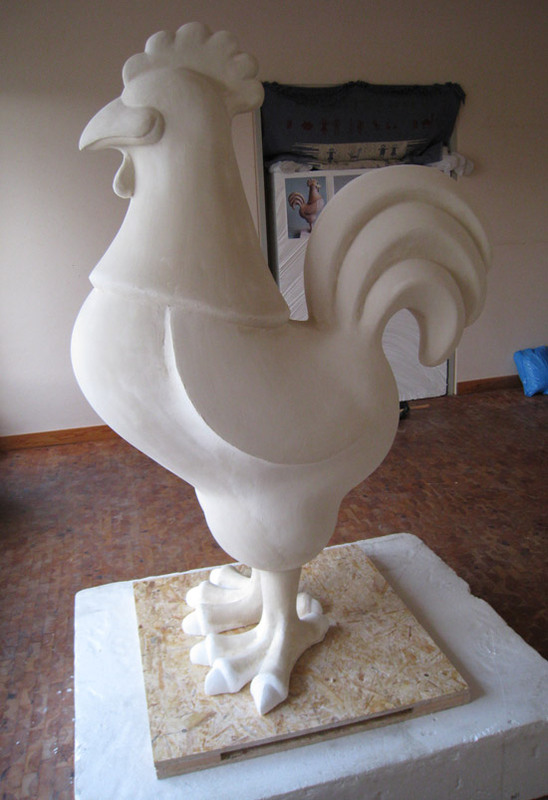 If more detail is required, the carved polystyrene can be covered in a layer of clay, which can then be sculpted with more detail. 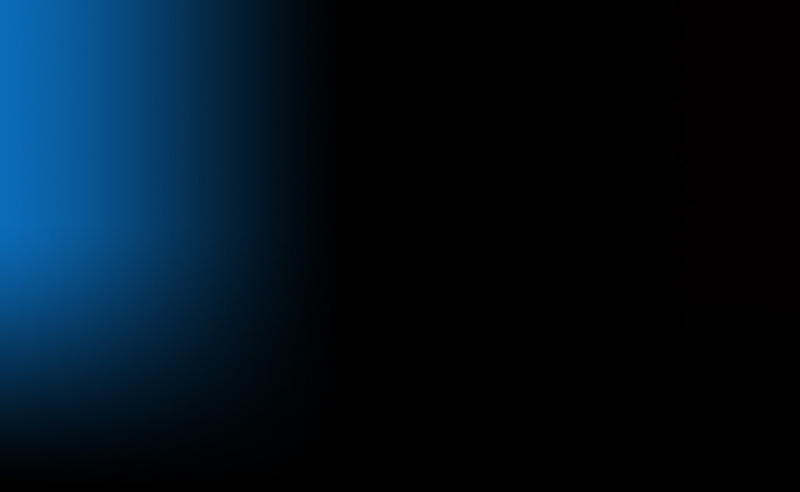 Below are a few images showing the various stages of development starting from the original block. 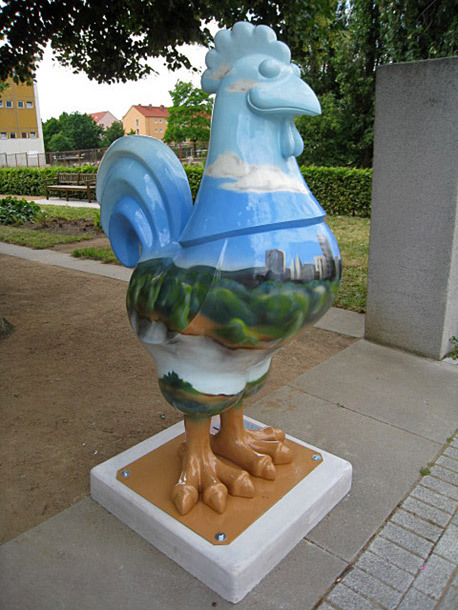 The small 33cm (1/5 scale) cockerel was constantly used as reference, it can be seen in the fourth picture (below, far right), standing underneath the tail of the full-scale model. 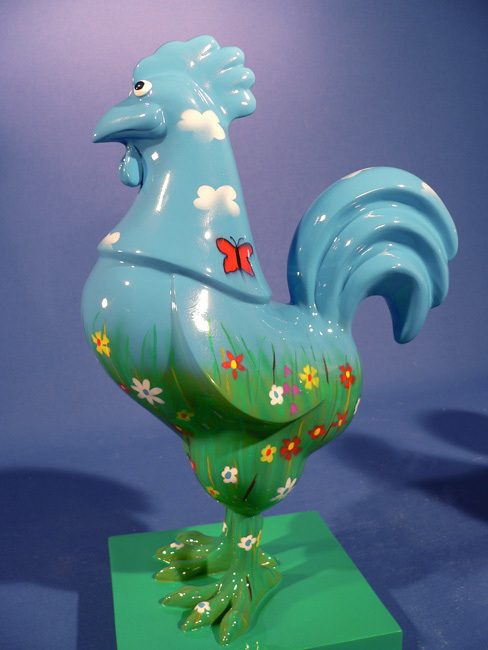 Although not originally planned, the small version also went into production (over 50 so far). 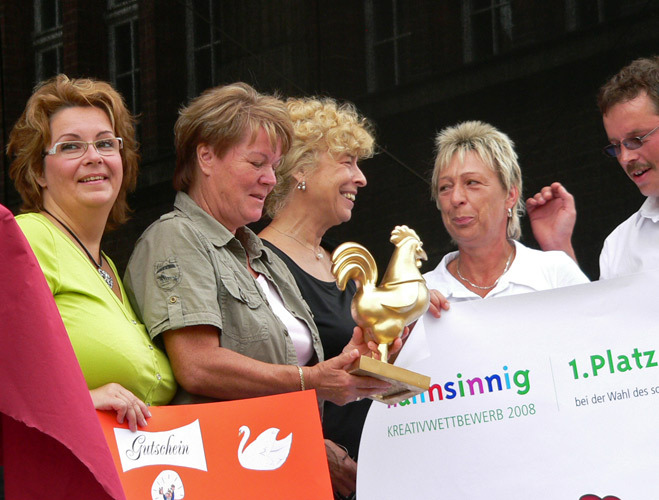 Pictured below (left) is one of the first production models, this was used for promotional purposes. 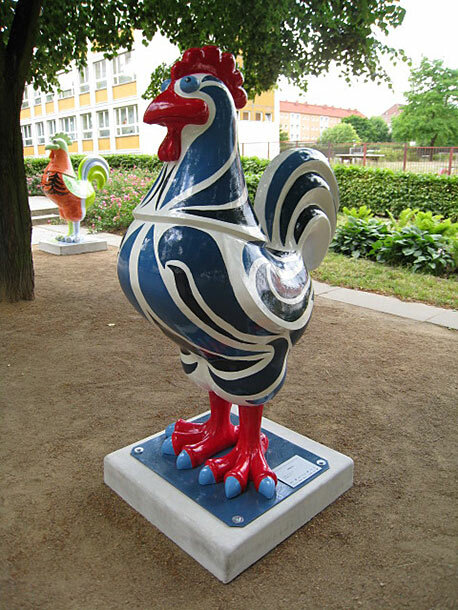 (design courtesy of Ulrich Wiedemann). 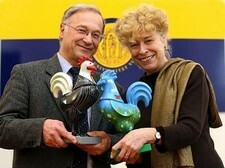 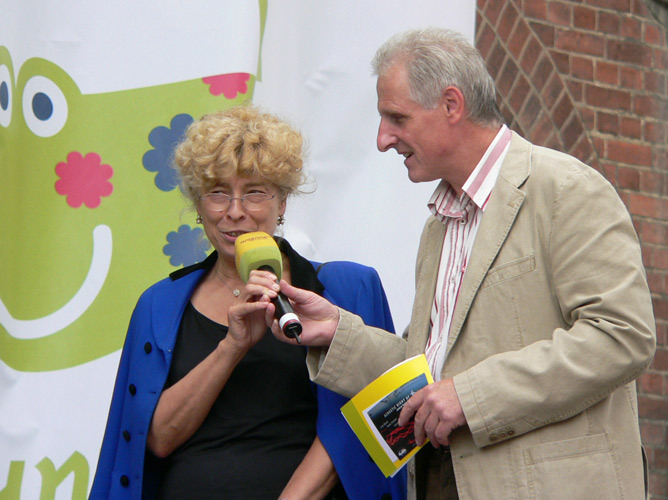 Below right, Frankfurt's Mayor Martin Patzelt und Prof. Dr. Gesine Schwan. 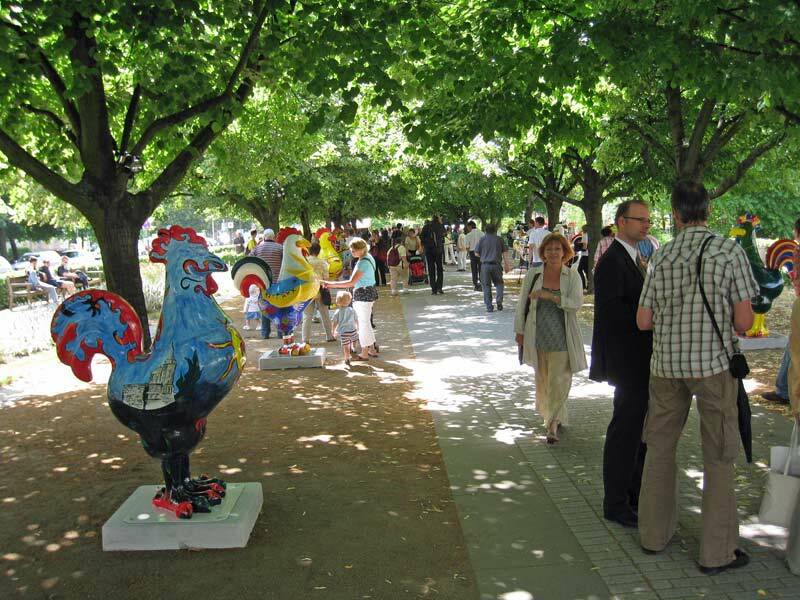 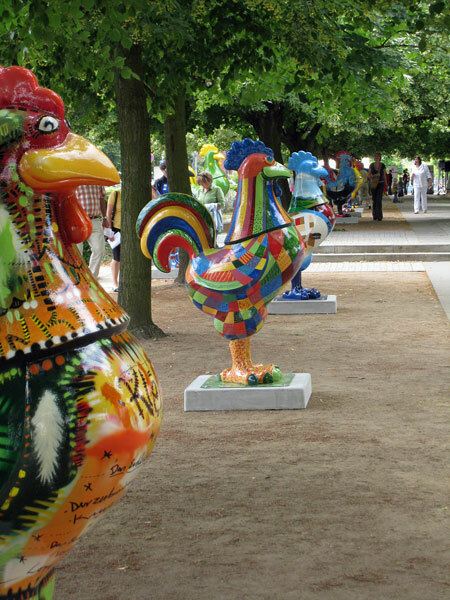 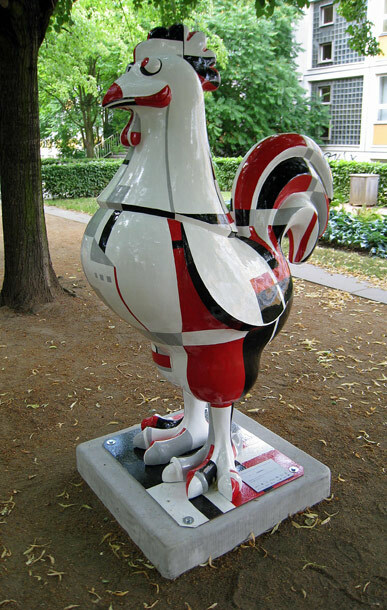 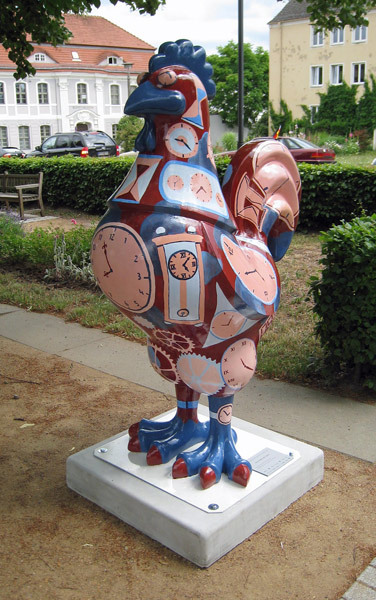 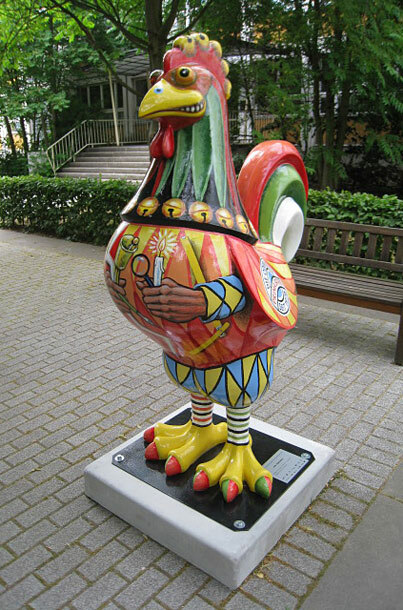 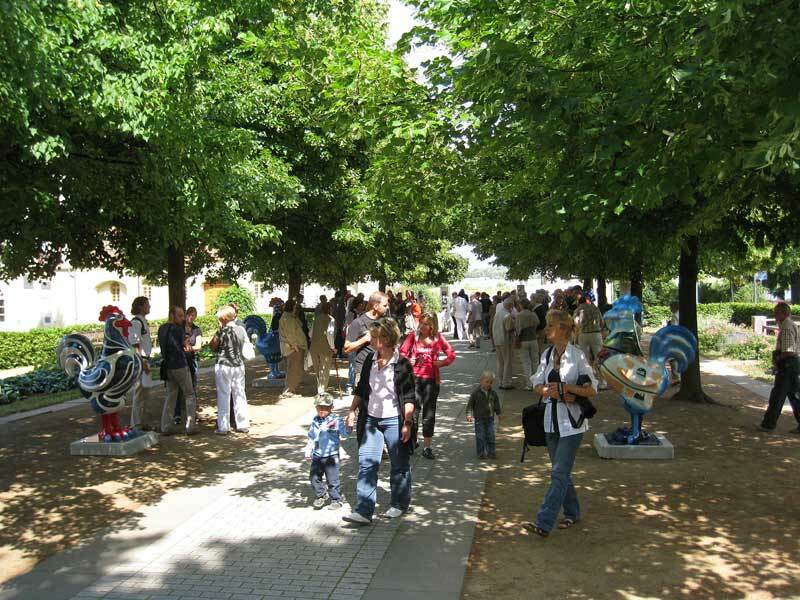 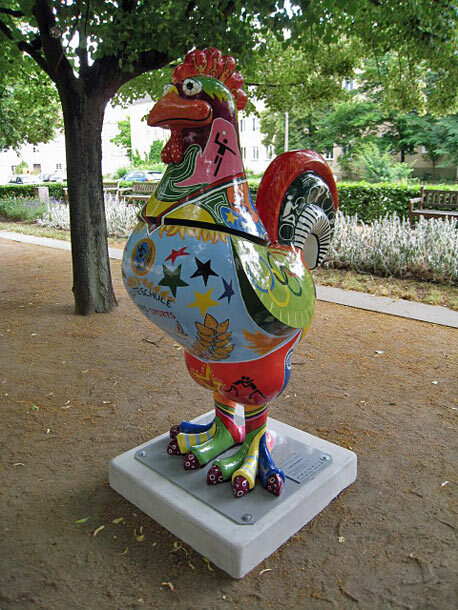 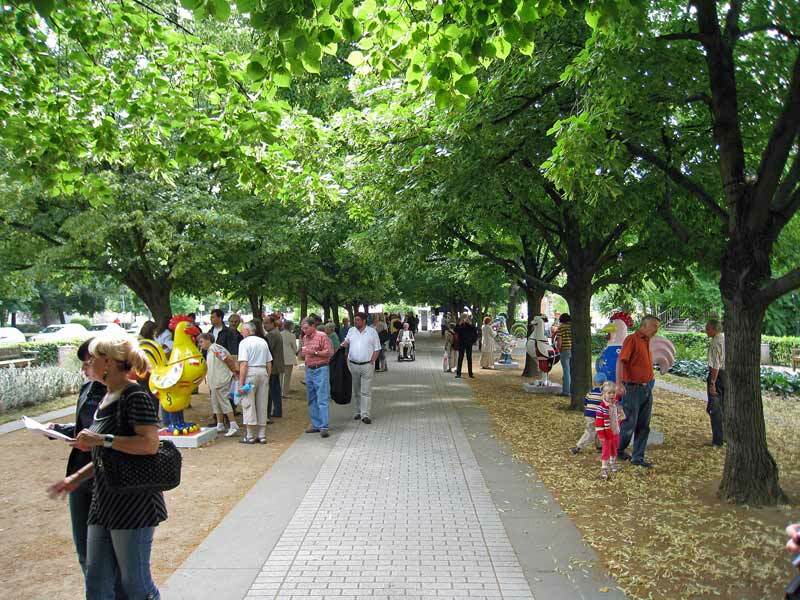 The cockerel is Frankfurt-Oder's coat of arms, and the idea was to produce a number of large-cockerel sculptures (between 1.6m and 1.7m tall) , which would be individually painted by different artists, and then displayed throughout the city. 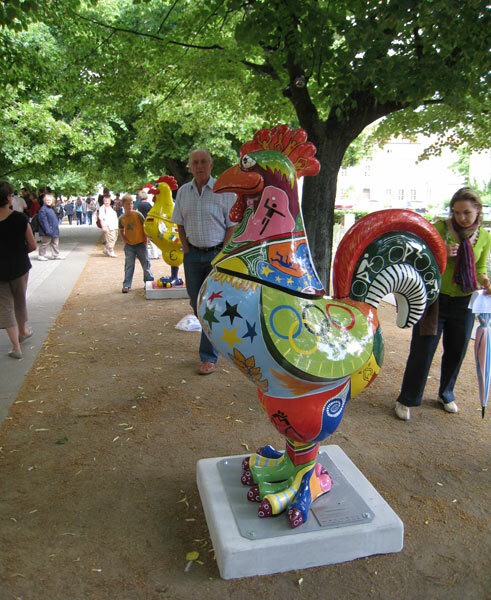 First of all, a scale model was made using clay, this allowed for easy modification until the design was finalized and approved. 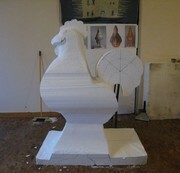 Once accepted, work on the full-size model could start, using the scale-model as reference. 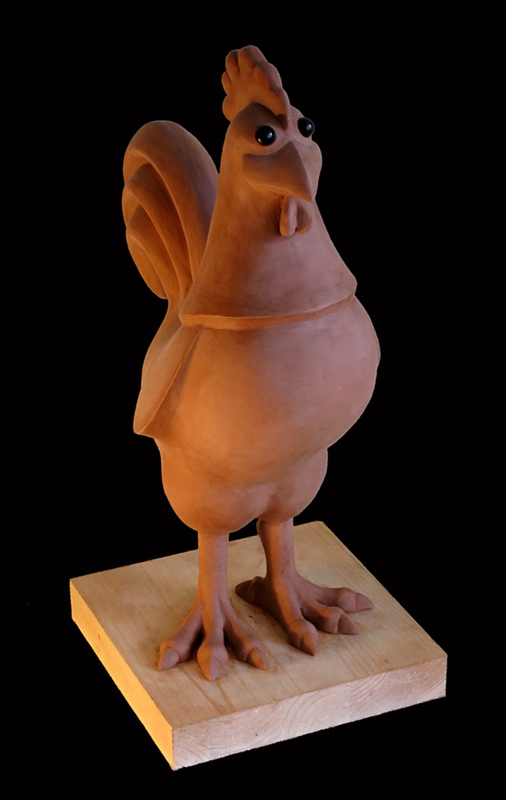 Below are a few pictures of the original design and clay model. Copyright 2009 www.kleinplastik.com Skulpturen und Plastiken aus Berlin All rights reserved. 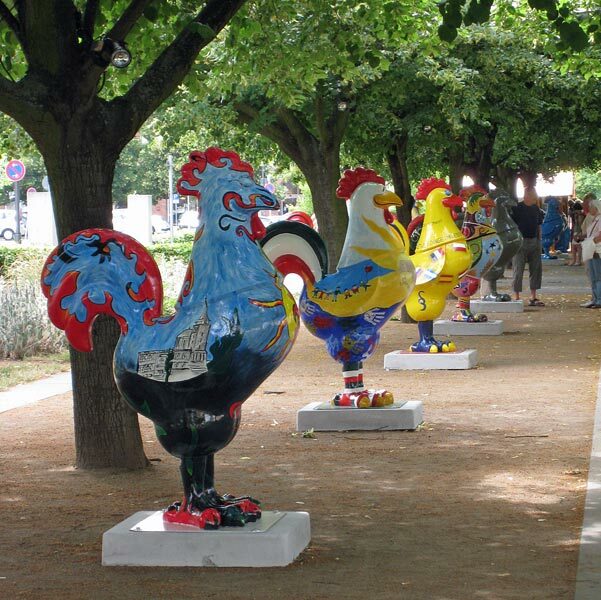 The making of "big bird"
Having gone on display, the citizens of Frankfurt had a chance to vote for their favorite designs (over 50,000 votes were cast). 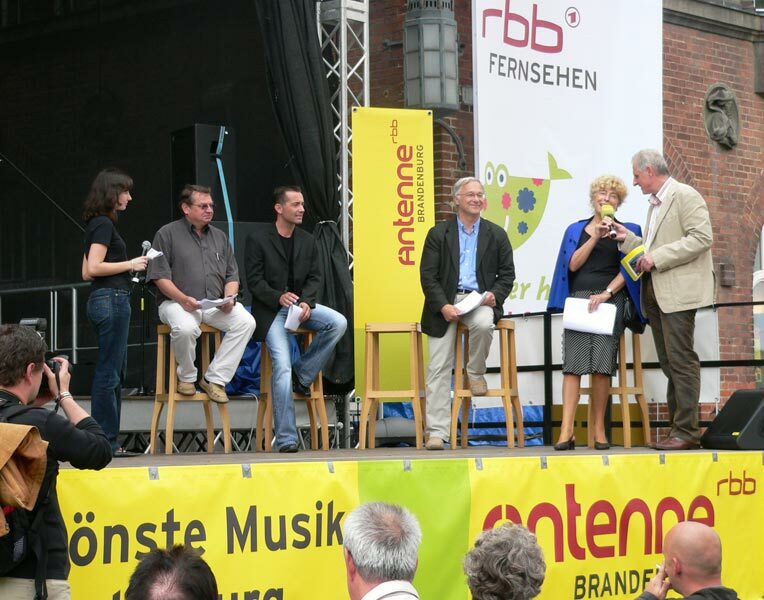 After two weeks, an event was held to announce the winners. 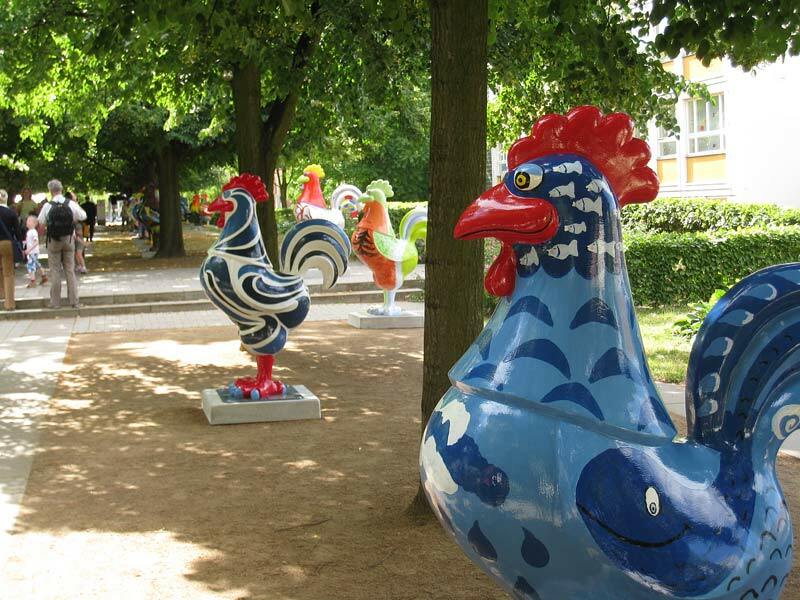 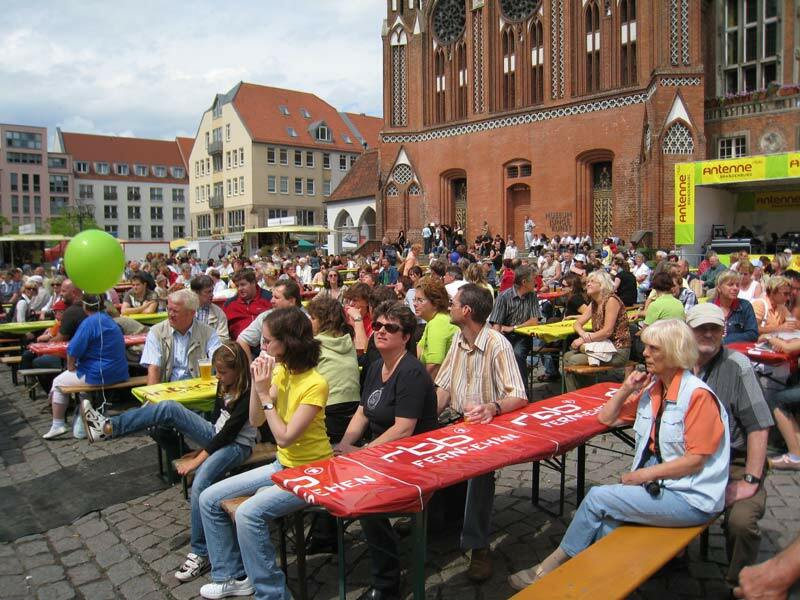 Pictured below are a few of the cockerels on display in Frankfurt's city center since the 27th June 2008. 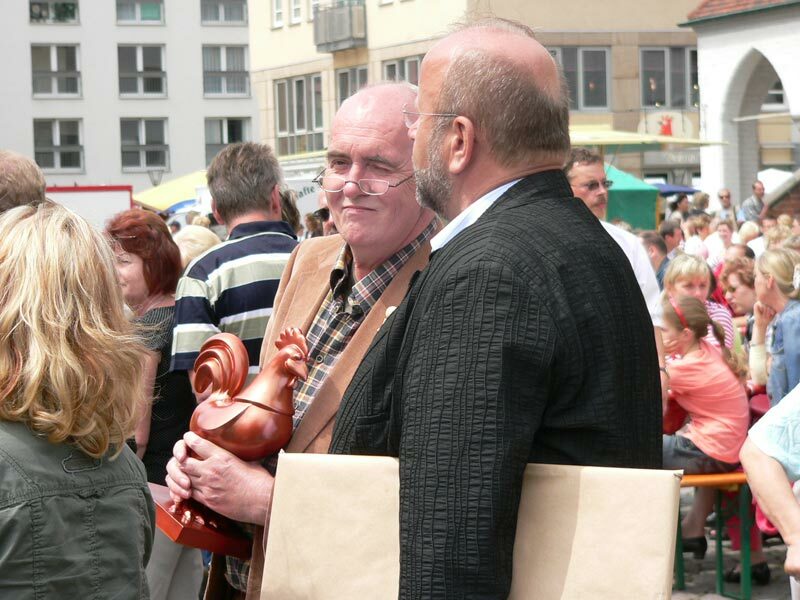 Pictured below are the 1st and 3rd place winners, I'm afraid I didn't manage to get a snap of 2nd, sorry. 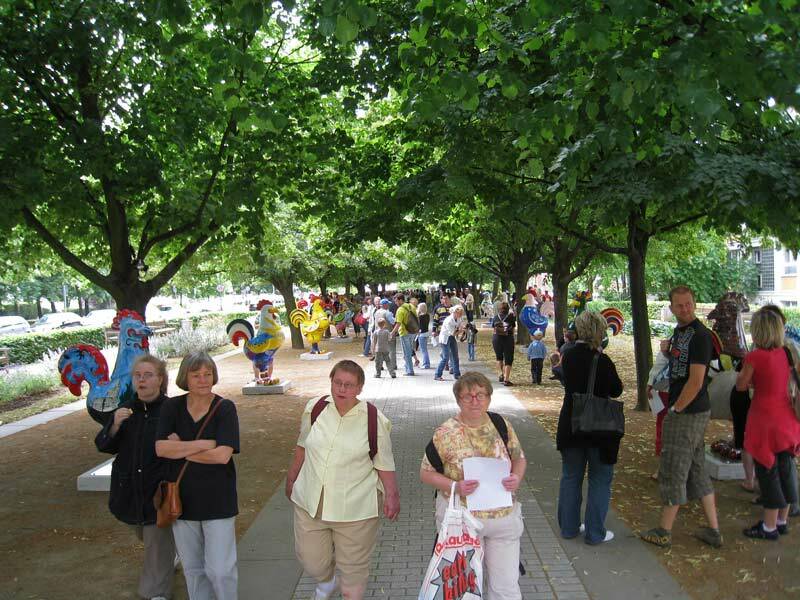 More and more visitors as the day goes on.